The Normativity of Rationality, Oxford: Oxford University Press (2017). 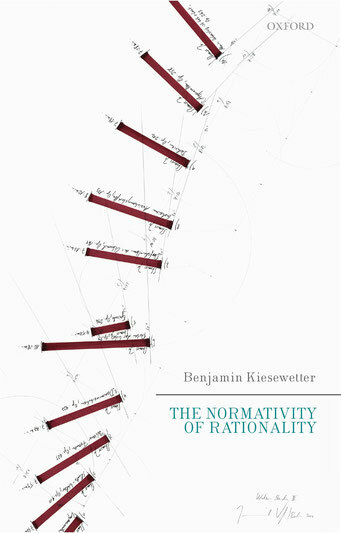 Ernst, Gerhard (2017): "Kommentar zu The Normativity of Rationality", Zeitschrift für philosophische Forschung 71 (4): 565–70. Mayr, Erasmus (2017): "Kommentar zu The Normativity of Rationality", Zeitschrift für philosophische Forschung 71 (4): 577–7. Worsnip, Alex (2018): "Benjamin Kiesewetter, The Normativity of Rationality", Notre Dame Philosophical Reviews, URL = https://ndpr.nd.edu/news/the-normativity-of-rationality/. PEA Soup Forum on The Normativity of Rationality , URL = http://peasoup.us/2018/07/ndpr-forum-the-normativity-of-rationality/. 1. "Ralph Wedgwood, The Value of Rationality", Ethics 129 (3), 501–8, 2019 (Original Review, Preprint). 1. “Is There a Liberal Principle of Instrumental Transmission?” (with Jan Gertken), article manuscript (PDF Download). 2. "Practical Conflicts as a Problem for Epistemic Reductionism about Reasons" (with Jan Gertken) (under revision). 3. "The Myth of Political Authority" (in preparation). 4. "Migration and Social Equality" (in preparation). 5. "Are Epistemic Reasons Normative?" (in preparation). 6. "Why There Is No Such Thing As a Motivating Reason" (in preparation).